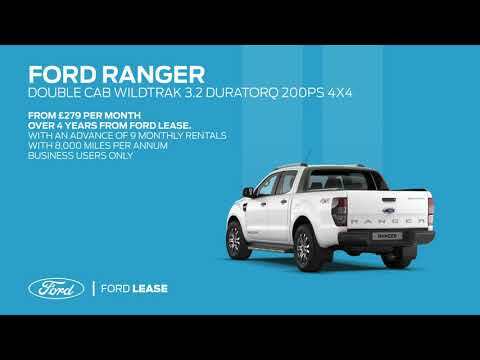 Until 30 June 2019, the Ranger Wildtrak 3.2 TDCi 200PS Auto is available from £299 per month on Ford Acquire with balloon over 4 years+. Finance subject to status. Guarantees may be required. Freepost Ford Credit. Subject to availability at a Ford UK Authorised Dealer for new vehicles contracted between 1 April and 30 June 2019 and registered by 31 December 2019. Failure to make payments on time may make obtaining credit in the future more difficult. Your vehicle may be repossessed if you do not keep up payments. Other paint colours may incur additional costs see price lists for details. The corporate tax, personal tax and VAT treatment associated with the purchase or leasing of a commercial vehicle may vary depending on your precise circumstances, relevant tax law and vehicle classification. Customers are therefore advised to seek professional advice with regard to taxation. Until 30 June 2019, you can drive away in the Ford Ranger Double Cab Wildtrak 3.2 TDCi 200PS from only £279 per month over 4 years on Ford Contract Hire from Ford Lease. Advance of 9 monthly rentals with 8,000 miles per annum^. Finance subject to status. Guarantees/Indemnities may be required. You will not own the vehicle at the end of the agreement. Examples exclude VAT and are based on non-maintained agreements with a mileage of 8,000 miles per annum. Vehicles must be returned in good condition and within agreed mileage, otherwise further charges will be incurred. Prices correct at time of going to print and are subject to change without notice. All vehicles subject to availability at a Ford UK Authorised Dealer for all vehicles contracted with finance accepted between 1 April and 30 June 2019, and vehicle registered by 31 December 2019. Not available with any other promotion. Ford Lease is provided by ALD Automotive Ltd, trading as Ford Lease, BS16 7LB. Other paint colours may incur additional costs see price lists for details. The corporate tax, personal tax and VAT treatment associated with the purchase or leasing of a commercial vehicle may vary depending on your precise circumstances, relevant tax law and vehicle classification. Customers are therefore advised to seek professional advice with regard to taxation.